The first JEE (Main) Examination of Paper-2 was conducted by NTA on 8 th January, 2019 in two shifts across 255 cities in the country and abroad. A total number of 1, 80,052 candidates were registered for Paper –2 (B. Arch. /B.Planning.) in this examination. There were 390 examination centres across the country and abroad. 474 Observers, 255 City-Coordinators and 25 State-Coordinators were deployed at these centres to oversee the smooth and fair conduct of examination. The results of Paper- 2 have been declared today. After the JEE MAIN APRIL-2019 Exam , the Ranks of the candidates will be released taking into consideration better of the two NTA Scores of all candidates appeared in JAN 2019 and APRIL 2019 examinations. The next online application for JEE (Main) April-2019 Examination opens from 8th February and shall remain open till 7th March 2019. The uploading of images and payment of the application fee can be done upto 8th March-2019. The JEE (Main) April 2019 Examination will be held in CBT mode between 6th and 20th April, 2019. Log-in using Application number, Date of Birth and Catcha code. 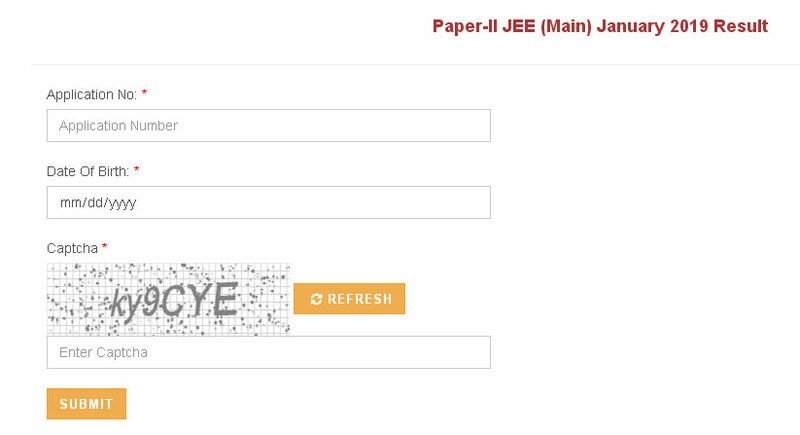 JEE Main Paper 2 Result 2019 will be displayed on screen. Take a printout for your use.